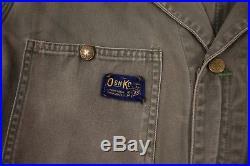 Mens Vintage OshKosh B'gosh 40s Green Coveralls Boiler Suit Small 36 XR 9342. 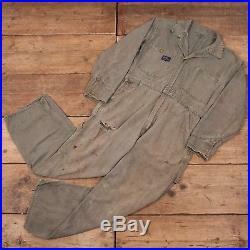 Gosh union made, sanforized cotton workwear coveralls with original two way Talon zip, multiple pockets and tool loop. 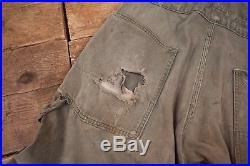 Lease be aware: This is a used workwear item. We will detail any major areas of wear or staining however please expect most items to have small marks or wear not always detailed below. 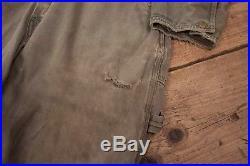 These wont detract from the look of the item. Measures around a 3 6 chest. The inside leg measurement is 28. Please see below for specific item measurements. 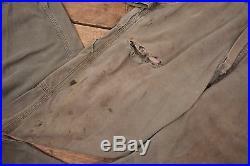 There are several rips and holes down the front and back of the legs as well as further holes and tears in the pockets. 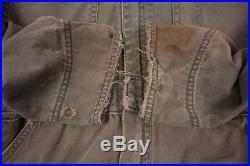 There is also fraying to the cuffs, hems and many of the seams. 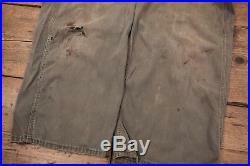 The majority of the wear is to the legs and the top half of the suit is in fairly good condition. Marks or Stains - There are. Areas of heavy staining down the sleeves and legs. 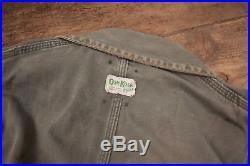 A few faint stains across the upper back, chest and collar. The material has aged and faded. Really nicely giving it a great, vintage look and feel. Please see images for details. Fastenings - Talon zips, embossed poppers and buttons. / 3 chest (including pen pocket) / 1 right leg / 2 back. Pit to Cuff - 18. Seam behind Collar to w. Hip to Hip - 17.5. _gsrx_vers_837 GS 7.0.15 (837). 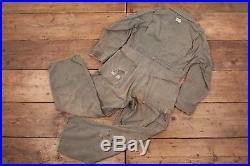 The item "Mens Vintage OshKosh B'gosh 40s Green Coveralls Boiler Suit Small 36 XR 9342" is in sale since Tuesday, August 7, 2018. 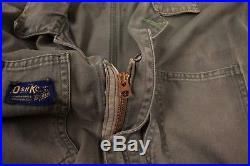 This item is in the category "Clothes, Shoes & Accessories\Men's Clothing\Other Men's Clothing". The seller is "holdwest" and is located in Sheffield. This item can be shipped worldwide.